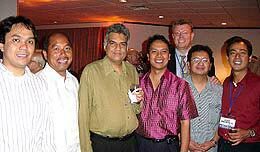 Philippine delegates on the 2003 Council of Asian Liberals and Democrats (CALD) Conference in Colombo Sri Lanka. “There is much to learn from the experiences of other countries, as we in the Philippines reflect on ways to overcome the problem of poverty and social marginalization”, said Rep. Butch Abad, LP-President and one of the presenters at the international meeting. Abad was joined by Rep. Dr. Neric Acosta, Vice President for Mindanao and Henry Bacurnay, President of Kalipi. The conference in the Sri Lankan capital was officially opened by the Prime Minister of Sri Lanka, Ranil Wickremesinghe and Dr. Werner Hoyer, the President of the European Liberal, Democratic and Reform Party (ELDR). For further information, please visit www.cald.org.